Here in Georgia, I’ll go to my gym and see some of the most bizarre stuff like someone doing bicep curls on a Bosu ball or doing a shoulder press with one hand and holding a medicine ball with the other. Then they say it’s “functional training”… or worse, their trainer says it. … or lift your grocery bags up and down while standing on a water bed. #BePrepared <= No, not really. Assume a wide stance with your feet slightly outside shoulder-width apart. Grab a KB or DB between your feet, keeping your abs tight, chest up and your lower back in a natural arch. Bend at the knees and grasp the KB or DB, then push through your heels to stand up. The reason: You’ll run and walk with more efficiency. You’ll also “teach” your brain and muscles how to pick up heavy stuff with ease (like your kids). 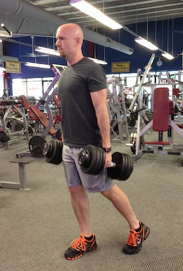 Holding a pair of heavy dumbbells, walk (I like to go a certain distance like 40 yards… or timed sets like 20 seconds). Keep your shoulders back and your abs tight. The reason: Better posture for one thing – which will make other exercises easier and relieve back pain. Plus, you’ll handle grocery bags and suitcases like a boss… all while making your heart pound as if you’re running on a treadmill. Hold a Plank position with a dumbbell next to one hand. While maintaining a straight line with your body, roll the dumbbell to the other side of your opposite hand. Repeat and go the other way. This is a beauty. I like to go 30 seconds, rest 30 seconds. Do this up to 4 times. It looks easy on paper, but it’s brutal. … and pushups help you push heavy objects and get off the floor with ease. Since we’re talking about unusual ab exercises, you’ll love the one I posted on my Facebook page this morning. Good article, I needed a good shoulder alternative! Hey Mike, I’m also in Georgia and as you know, the weather is changing quite rapidly for the better here in the south. So these three exercise swaps, are right on time and will start with those today. Keep bringing such simple yet effective and worthwhile techniques, really appreciate it! You bet I will Todd! That’s awesome about Georgia. I tell you, this weather has been bipolar recently! Yes Mikey, the weather has been crazy, but my area (east Atlanta) hasn’t had ANY snow. That’s why I can do what suggest outdoors. Yeah! !